SWORD 3.0 is a protocol enabling clients and servers to communicate around complex digital objects, especially with regard to supporting the deposit of these objects into a service like a digital repository. Complex digital objects consist of both Metadata and File content, where the Files may be in a variety of formats, there may be many files, and some may be very large. The protocol defines semantics for creating, appending, replacing, deleting, and retrieving information about these complex resources. It also enables servers to communicate regarding the status of treatment of deposited content, such as exposing ingest workflow information. The first major version of SWORD [SWORD 1.3] built upon the Resouce creation aspects of AtomPub [AtomPub] to enable fire-and-forget package deposit onto a server. This approach, where the depositor has no further interaction with the server is of significant value in certain use cases, but there are others where this is insufficient. Consider, for example, that the depositor wishes to construct a digital artifact file by file over a period of time before deciding that it is time to archive it. In these cases, a higher level of interactivity between the participating systems is required, and this is the role that SWORD 2.0 [SWORD 2.0] was subsequently developed to fulfil. An Object that exists on the server, probably as a result of a deposit operation, which is a container for Metadata and zero or more Files. A format for describing one or more files to be deposited By-Reference. A single expression of both the Metadata and the By-Reference file deposits. A serialisation of the entire Object, consisting of its Metadata and Binary Files. Describes an error that occurred while processing a request. All SWORDv3 extensions are defined within this namespace. This Namespace also serves to identify the SWORD version for a given Service. Some Files are expressions of the Object's metadata. The SWORD Object is expressed as JSON via the Status Document, along with all its supporting metadata and workflow information. These are the HTTP headers used by SWORD, and their meanings within the context of the protocol. Where a Default Value is specified, this is what value the client or server MUST take the value to be if it is not provided explicitly in a request or response. Digest Checksum for the depositing content. MUST include SHA-256, and allows for other formats such as MD5 and SHA (SHA-1) if still needed by the server. ETag Object version identifier, as provided by the server on GET requests and any requests which modify the object and return. If-Match Used to provider the server’s Object version identifier (ETag) for the version on which this request is intended to act. If the supplied ETag does not match, this means that the version on the server has changed since the client’s last operation, the server MUST reject the update. The client will need to retrieve the latest ETag and re-issue the request, taking into account any changes. In-Progress Whether this operation is part of a larger deposit operation, and the server should expect subsequent related requests before injecting the item into any ingest workflows. This section lists the actual on-the-wire protocol operations that are part of SWORDv3. Actual usage of each of these operations is dependent on the action that you wish to take. See Protocol Requirements for the rules which govern how to use these Protocol Operations. The full set of protocol operations is available as an OpenAPI definition [OpenAPI], available as JSON and YAML. The following error responses are possible against some or all of the HTTP Requests. In each case an Error Document MUST be returned by the server with details as to the root cause of the error. 400 (BadRequest) - The server could not understand your request. Either your headers or content body are wrong or malformed. 412 (Precondition Failed) - There is a problem implementing the request as-is. This can happen for the following reasons: your checksums may not match, you may have requested mediated deposit when the server does not support that, your headers may not be consistent with each other, your If-Match headers may not mat the current ETag, or your Segmented Upload Initialisation request may not be within parameters acceptable to the server. These are the HTTP requests that are covered by the SWORD protocol. Each request MAY be responded to by the server with a redirect code (see above). Each request MAY also generate an error; possible errors are listed for each section, please refer to the section above for details on the meanings of errors. Content to replace the Metadata. This must be a Metadata Document. Segment to be added to the Resource. This section describes the requirements of every kind of operation that you can do with SWORDv3. When combined for a specific request. For example: Creating (Request) a new Object by request to the Service-URL (Resource) with Packaged Content (Content), these aspects tell you the exact requirements. The requirements below are presented using a hierarchy; for any given combination of Request, Content and Resource all requirements above the relevant node should be imported when considering the actual requirements for an operation. See the document SWORDv3 Behaviours to see each of the behaviours SWORDv3 is capable of with its requirements fully expanded. If more than one By-Reference File is present, MUST reject the request. The server MAY attempt to unpack the file, and create derivedResources from it. If a Slug header is provided, MAY use this as the identifier for the newly created Object. MUST respond with a 201 if the item was created immediately, a 202 if the item was queued for import, or raise an error. If In-Progress is false, SHOULD expect further updates to the item, and not progress it through any ingest workflows yet. If accepting the request MUST attach the By-Reference files to the Object. If accepting the request MUST populate the Object with the supplied Metadata, and attach the By-Reference files to it. MUST respond with a 201 to indicate that the Segmented Upload has been initialised, or raise an error. MUST respond with a 200 if the request was accepted immediately, a 202 if the request was queued for processing, or raise an error. If accepting the new Metadata MUST add the Metadata to the item, and only treat this as an extension to existing Metadata. The server MUST NOT overwrite or otherwise remove existing Metadata. If accepting the new File, MUST remove all existing Files from the Object and replace with the new File. The new File should be marked as an originalDeposit. The server MUST also remove all Metadata, so the Metadata Resource contains no fields. If accepting the new Metadata, MUST remove all existing Files from the Object, and MUST replace the existing Metadata with the new. If accepting the new By-Reference files, MUST remove all existing Files from the Object and replace with the By-Reference files. The server MUST remove the existing Files immediately, even before the By-Reference files have dereferenced. The new files MUST be marked as originalDeposits. The server MUST also remove all Metadata, so the Metadata Resource contains no fields. If accepting the new Metadata and By-Reference files, MUST remove all existing Files from the Object and replace with the By-Reference files. The server MUST remove the existing Files immediately, even before the By-Reference files have dereferenced. The server MUST also replace all existing Metadata with the new Metadata. If accepting the new Metadata MUST entirely replace the existing Metadata with the new. MUST respond with a 204 if the replacement was deposited immediately, a 202 if the replacement was queued for import, or raise an error. If accepting the request, MUST attach all the By-Reference files to the Object as originalDeposits, and MUST add the Metadata to the item, and only treat this as an extension to existing Metadata. The server MUST NOT overwrite or otherwise remove existing Metadata. MUST reject the request if the segment is incorrect or unexpected: for example, all segments were already received, or the segment is a different size than expected. MUST be able to store the incoming file segments as they arrive, and then reconstitute them into a single file when all segments have been received. If successful, MUST respond with a Segmented File Upload Document describing the current state of the upload. The Service Document defines the capabilities and operational parameters of the server as a whole, or of a particular Service-URL. The Service Document consists of a set of properties at the root, and a list of "services". Each service may define a Service-URL and/or additional properties and further nested "services". For the purposes of normalising the data held in the Service Document (for brevity of the serialised document), the Service Document MAY specify at the root properties which MUST be taken to hold true for all nested "services" (at any level below) unless that lower service definition overrides the properties. A service which sits beneath the root of the Service Document and above another Service, MAY also redefine properties, and those overrides MUST be considered to cascade down to Services beneath that one. A Service Document can be retrieved either for the root of the service, or from any Service within the hierarchy of Services available. If the root Service Document is requested, the full list of Services, including all their children, MUST be provided. If the URL of a Service is requested, it MUST only provide information about itself and its children. The full JSON Schema [JSON-SCHEMA] can be downloaded here. This field is used to define the type of the document, and in this case should always be 'ServiceDocument'. MUST be present. accept array List of Content Types which are acceptable to the server. acceptDeposits boolean Does the Service accept deposits? SHOULD be present. If omitted, the client MUST assume that the service does not accept deposits. acceptMetadata array List of Metadata Formats which are acceptable to the server. acceptPackaging array List of Packaging Formats which are acceptable to the server. authentication array List of authentication schemes supported by the server. SHOULD be present. If not provided the client MUST assume the server does not support authentication. byReferenceDeposit boolean Does the server support By-Reference deposit? SHOULD be present. If omitted, the client MUST assume the server does not support By-Reference deposit. collectionPolicy object URL and description of the server’s collection policy. digest array The list of digest formats that the server will accept. MUST be present, and MUST include SHA-256, MAY include any others. SHOULD be present. If omitted and segmented upload is supported, the client MUST assume the server will accept a file of any size. maxByReferenceSize integer Maximum size in bytes as an integer for files uploaded by reference. SHOULD be present. If omitted, the client MUST assume the server will accept a file of any size. maxSegments integer Maximum number of segments that the server will accept for a single segmented upload, if segmented upload is supported. SHOULD be present. If omitted, the client MUST assume the server will accept any number of segments. maxUploadSize integer Maximum size in bytes as an integer for files being uploaded. SHOULD be present. If omitted, the client MUST assume the server will accept an upload of any size. SHOULD be present. If omitted, the client MUST assume the server does not support On-Behalf-Of deposit. root string The URL for the root Service Document. MAY be present. If omitted, the client MUST assume the server does not support Segmented Upload. stagingMaxIdle integer What is the minimum time a server will hold on to an incomplete Segmented File Upload since it last received any content before deleting it. SHOULD be present. If omitted, the client MUST assume that the server will hold on to the incomplete file indefinitely. Servers MAY delete the unfinished upload at any time after the minimum time stated here has elapsed. treatment object URL and description of the treatment content can expect during deposit. The default SWORD Metadata document allows the deposit of a standard, basic metadata document constructed using the DCMI terms [DCMI]. This Metadata document can be sent when creating an Object initially, when appending to the metadata, or in replacing the metadata or indeed the Object as a whole. The format of the document is simple and extensible (see the Metadata Formats section). The dc and dcterms vocabularies are supported, and servers MUST support this metadata format. This field is used to define the type of the document, and in this case should always be 'Metadata'. MUST be present. If the client omits the Metadata-Format header, the server MUST assume that it is the above format. The By-Reference document allows the client to send a list of one or more files that the server will fetch asynchronously. The By-Reference document can be sent when creating an Object initially, or when appending to or replacing the FileSet in the Object, or replacing the Object as a whole. This field is used to define the type of the document, and in this case should always be 'ByReference'. MUST be present. byReferenceFiles.contentDisposition string Content-Disposition as it would have been supplied if this were a regular file deposit. byReferenceFiles.contentLength integer Content-Length as it would have been supplied if this were a regular file deposit. byReferenceFiles.dereference boolean Should the server dereference the file (i.e. download it and store it locally) or should it simply maintain a link to the external resource. MUST be present. Note that servers MAY choose to do both, irrespective of the value here, though if false, the server should make the external link available to users accessing the resource. byReferenceFiles.digest string Digest as it would have been supplied if this were a regular file deposit. If no date is provided, the server MAY assume the file will be available indefinitely. In some cases it is convenient to be able to send both Metadata and By-Reference files in a single request. This is possible because both Metadata and By-Reference documents are simply JSON documents; contrast this with sending Metadata and Binary Files, where a package is required. To do this, the client may include the Metadata and By-Reference documents embedded in a single JSON document, structured as shown below. The entire Metadata document (including its JSON-LD @context) is embedded in a field entitled metadata, and the entire By-Reference document (again, with its JSON-LD @context) is embedded in a field entitled by-reference. When a document of this form is sent, the client MUST set the Content-Disposition header appropriately, to alert the server of its required behaviour. The status document is provided in response to a deposit operation on a Service-URL, and can be retrieved at any subsequent point by a GET on the Object-URL, and is returned each time the client takes action on the Object-URL. It tells the client detailed information about the content and current state of the item. "description" : "the item is currently inProgress"
"log" : "[any information associated with the deposit that the client should know]"
This field is used to define the type of the document, and in this case should always be 'Status'. MUST be present. actions object Container for the list of actions that are available against the object for the client. actions.deleteFiles boolean Whether the client can issue a request to delete files in the item. This may be a single file or all files. actions.deleteMetadata boolean Whether the client can issue a request to delete all the item metadata. actions.deleteObject boolean Whether the client can issue a request to delete the entire object. actions.replaceFiles boolean Whether the client can issue a request to replace files in an item. This may be a single file or all of the files. actions.replaceMetadata boolean Whether the client can issue a request to replace the item metadata. forwarding array List of other locations where the object is available. lastAction object Container for information about the last action taken on the object by a client (not necessarily the current client). MAY be present. For example, the URL from which an end-user would download the file via the website. This related URL does not need to support any of the SWORD protocol operations, and indeed may even be on a server or application which has no sword support. Primary use case is to redirect the user to the web front end for the repository. links.dcterms:replaces string URL to an older version of the file in the same Object, if this is also present as a resource. links.depositedOnBehalfOf string Identifier for the user that the item was deposited on behalf of. links.derivedFrom string Reference to URL of resource from which the current resource was derived, for example, if extracted from a package that was deposited. links.log string Any information associated with the deposit that the client should know. links.packaging string The package format identifier if the resource is a package. links.rel array The relationship between the resource and the object. MUST be present. Note that multiple relationships are supported. links.status string The status of the resource, with regard to ingest. state array List of states that the item is in on the server. At least one state MUST be present, using the SWORD state vocabulary. Other states using server-specific vocabularies may also be used alongside. state. @id string Identifier for the state. MUST be present. At least one such identifier MUST be from the SWORD state vocabulary. An alternate, non-SWORD URL which will allow the user to access the same object. For example, this could be the URL of the landing page in the repository for the item. The resource (file or package) was explicitly deposited via some deposit operation. A file which was unpacked or otherwise derived from another deposited resource, and which itself was not explicitly deposited through some deposit operation. The main usage would be to identify files which were extracted from a deposited zip file. A resource which makes this object available packaged in the specified package format on HTTP GET. This is not a resource which has been deposited or derived (though it may be very similar to an originally deposited package), it is one which the server makes available as a service to the client. Packages may be pre-built or assembled on the fly - that responsibility rests with the server. A resource which makes this object’s metadata available, serialised in the specified metadata format on HTTP GET. This is not a resource which has been deposited or derived (though it may be very similar to the originally deposited metadata), it is one which the server makes available as a service to the client. Metadata documents may be pre-built or assembled on the fly - that responsibility rests with the server. A file which is currently being downloaded from an external reference. Often will also have the rel for originalDeposit, and once all segments have been uploaded the byReferenceDeposit rel can be removed. A File which can be considered by the client to be part of the FileSet. Files in this state are available for modification via the SWORD protocol, and should be considered to form the actual "content" of the Object. The state field is a list, so it may also contain other states that are server-specific in addition to the SWORD values. Some files, when deposited, may be processed asynchronously to the client’s request. For example, large files that require unpacking, by-reference deposits, etc. In these cases, the client will not receive feedback on the state or success of their deposit in the request/response exchange. Instead, the client may monitor the file(s) via the Status document, and for each appropriate file (Original Deposits), a “status” field will provide information on the current status of processing for that file. the server has not yet started to process this file. It may be in a queue, or it may still be in the process of deposit via a Segmented Upload. there was an error either downloading or unpacking your file; information should be available in the “log” field to aid the client in understanding what went wrong. A client may request information on an ongoing Segmented File Upload at any point via a GET to the Temporary-URL. This field is used to define the type of the document, and in this case should always be 'Temporary'. MUST be present. segments.received array The list of integers identifying the segments that have been successfully uploaded so far. segments.segment_size integer The expected size in bytes of the segments (except the final one) that will be uploaded. segments.size integer The expected size in bytes of the final resulting assembled file. An error document is returned at any point that a synchronous operation fails. "log" : "text log of any debug information for the client"
This field is used to define the type of the document, and in this case should be one of the allowed Error Doucment types. MUST be present. log string Some detail as to the error, with any information that might help resolve it. timestamp string When the error occurred. AuthenticationFailed 403 The request supplied invalid credentials, or no credentials, when the server was expecting to authenticate the request. ContentMalformed 400 The body content of the request was malformed in some way, such that the server cannot read it correctly. ContentTypeNotAcceptable 415 The Content-Type header specifies a content type of the request which is in a format that the server cannot accept. ETagNotMatched 412 The client supplied an If-Match header which did not match the current ETag for the resource being updated. FormatHeaderMismatch 415 The Metadata-Format or Packaging header does not match what the server found when looking at the Metadata or Packaged Content supplied in a request. MaxUploadSizeExceeded 413 The request supplied body content which is larger than that supported by the server. OnBehalfOfNotAllowed 412 The request contained an On-Behalf-Of header, although the server indicates that it does not support this. SegmentedUploadTimedOut 405 The client's segmented upload URL has timed out. Servers MAY respond to this with a 404 and no explanation also. ValidationFailed 400 The server could not validate the structure of the incoming content against its expected schema. This may include the JSON schema of the SWORD documents, the metadata held within those documents, or the expected structure of packaged content. It is strongly RECOMMENDED that SWORD servers support authentication and authorisation for requests. SWORD servers are not restricted in the forms of authentication that they employ, and there is no minimum requirement or default supported approach. Servers SHOULD enumerate the authentication schemes that they support in the Service Document, in the field authentication, and MUST draw from the IANA registry of HTTP auth scheme names [IANA Auth] where one is available. Where an authentication scheme is in use by the server which is not covered by the IANA registry - such as a custom API-token-based approach, the server MAY indicate this in whatever way seems most appropriate. Servers MAY also choose to support On-Behalf-Of deposit, which means that the authenticating user is providing content to the server, as if another user were actually carrying out this request. A use case for this would be when a known third-party deposit tool is sending content to a server and has been authorised by another user to add content on their behalf. If a server supports On-Behalf-Of deposit, it SHOULD indicate this in the Service Document with the field onBehalfOf set to true. If this field is not present clients MUST assume that the server does not support On-Behalf-Of deposit. When carrying out authenticated requests, Authorization headers MUST be sent with every request to the server - the server is not responsible for maintaining state for the client. The server is responsible for authenticating and authorising every request individually. Clients may choose also to send Cookie headers, and servers may support these, but support for Cookies is explicitly outside this specification. When an On-Behalf-Of deposit is received, the server MUST ensure that the user identified in that header is valid with respect to the associated Authorization header. For example, when using OAuth2, the On-Behalf-Of user MUST match the user for which the token in the Authorization header was granted. In all cases (On-Behalf-Of or not) where a user has authenticated to make a deposit, servers SHOULD preserve the user's identity in the depositedBy property of the Original Deposit in the Status document. In On-Behalf-Of deposit, the value given in the On-Behalf-Of header SHOULD be used for the value of the depositedOnBehalfOf property of the Original Deposit in the Status document. Note that recording a user's identity in this way does not have to contain enough information for the client to directly identify the user, and implementers should take note of privacy legislation when choosing what information to expose in these fields. It is strongly RECOMMENDED that servers implement modern transport layer security, whether authenticating requests or not. If you are carrying out authenticated protocol operations you MUST implement TLS. SWORD uses the Content-Disposition header in client requests to indicate to the server information about the payload being delivered. Traditionally Content-Disposition is an HTTP response header, but it makes sense in the PUSH context of SWORD to use this as a request header. We follow [RFC6266] for its usage. Implementers should also note [RFC5987] if sending filenames which require characters outside the ISO-8859-1 character set. Each of these has a different Content-Disposition, which makes it clear to the server what it should do with that content. metadata=true - Indicates that the body content of the request contains Metadata. A Direct Deposit containing Metadata MUST contain this parameter. by-reference=true - Indicates that the body content of the request contains By-Reference files. A Direct Deposit containing By-Reference files MUST contain this parameter. filename=[filename] - Indicates the intended filename of the deposited file. MAY be present, and if present the server SHOULD respect it. If using a character set outside of ISO-8859-1, you MUST use filename* instead. size=[bytes] - The total size of the final file. This MUST be sent so that the server can determine when all the bytes of the file have been uploaded. digest=[digest] - The Digest information for the resulting file as a whole, after assembly. This MUST be present, and MUST be in the same form as if it were the HTTP header you would use if depositing this file as a whole. segment_count=[n] - The total number of segments that will be sent to the Temporary-URL. This MUST be present. Later, any segment uploads with segment_number greater than this number MUST be rejected by the server. segment_size=[bytes] - The size of each segment (except the final segment) that the client will be sending. This MUST be present. If a non-final segment is sent with a different size, this MUST be rejected by the server. segment_number=[n] - The position in the full sequence of this segment. This MUST be present. It MUST be an integer, and MUST start counting at 1. Full list of segments MUST be a sequential list of integers. In order to ensure that the content transmitted via SWORD is correct when it arrives at its destination, clients MUST provide Digests that servers MUST check against incoming content. The Server SHOULD list all the digest formats that it supports. Servers MUST support at least SHA-256 and MAY support any other digest formats. SWORD uses the recommendations of [RFC3230] for transmitting base64 encoded Digests of request bodies. The server MUST validate at least one digest, SHOULD validate all digests, though MAY choose its preferred format to validate against. Servers MAY choose to implement concurrency control, in order to ensure that clients do not accidentally overwrite or make changes that conflict with other changes which may have happened to the Object since it was first deposited. Note that this does not prevent clients causing damage to Objects, only that it cannot be so easily done by accident. Modifications to the Object from agents on the server-side, such as administrators, etc. In order to provide concurrency control, SWORD follows [RFC7232], and specificially uses the ETag and If-Match headers. On each request for a resource, or when the Status document is retrieved, the ETag for the resource MUST be returned. The ETag gives the client an opaque identifier for the current version of that resource. When the resource is being updated by the client (for example, it is replacing a File), the ETag that the client expects to be the current one MUST be sent in the If-Match header. The server MUST then compare that with its actual current ETag for the resource. If they match, the request can go ahead, otherwise the Server MUST respond with an error (412). Note that ETags, and Concurrency Control in general, is only applicable from the Object downwards. There are no requirements for use of ETag or If-Match headers on Service-URLs. The server does not have to announce support for concurrency control in the Service Document. Clients MUST check response headers for the presence of an ETag. Presence of the ETag indicates that the server requires the client to pay attention to its concurrency control procedures, and to carry out later requests with an If-Match header. If supporting concurrency control, Servers MUST provide an ETag on all responses to requests (GET, POST, PUT) against resources from the Object and below. If a server supports Concurrency Control, it MUST behave in accordance with the following rules. An ETag MUST be provided for each SWORD resource: the Object, the Metadata, the FileSet and any Files. The ETag is a resource-level version identifier, it MUST be the same for all expressions of the resource. For example, all serialised Metadata documents (such as in JSON, or in XML) MUST have the same ETag as the Metadata resource, and each other. If the ETag supplied by the client in the If-Match header does match the current ETag for the resource, the request MUST go ahead as normal. The server MUST include the ETag in the HTTP headers of every GET request for a resource. The server MUST include the ETags for the resources in the appropriate places in the Status document. If a resource is modified, the ETags of all resources within which it is contained MUST change. The server MAY NOT track previous ETag values for a resource. If an ETag of a resource changes, the resources above it (up to the level of the Object) MUST also change. This is to prevent a change at a higher level (e.g. an Object replacement) overwriting a change at a lower level (e.g. addition of a single file). So, for example, if the Metadata is updated, then the Metadata and Object ETags MUST change, but the FileSet and File ETags MAY NOT. Similarly, if a File ETag changes, then the FileSet and Object ETags must also change, while the Metadata ETag MAY NOT. Some systems may wish to give the client more control over the ingest process, and SWORD uses the In-Progress HTTP header to allow the client to indicate that a deposit should not yet be injected into any post-submission or pre-ingest workflow. The In-Progress header MUST take the value true or false, and if it is not present the server MUST assume that it is false and behave as described below. An example use case for this is that the client may be embedded into a system which uses the SWORD server as a storage layer, but which cannot acquire all of the content for a "finished" item in one deposit operation. Consider a user-facing system which encourages users to upload files one at a time through some web interface, which causes each file to be directly deposited onto the SWORD server. At the start of the deposit the client asserts that deposit is In-Progress: true, and then proceeds to upload files. If uploading them to the Object-URL the client continues to assert In-Progress: true on each request (if depositing to other URLs this is not necessary). This goes on until the user confirms that they have uploaded all the relevant files, or navigates away from the page. At that stage, the client can issue a blank HTTP POST request to the SWORD server, with In-Progress: false to complete the deposit. Note that the In-Progress header is intended to indicate to the server that further content will be coming in which is associated with the existing content, before it can be considered "complete". It is not intended to provide workflow control, and clients MUST NOT assume that asserting In-Progress: true will have any specific effect on the state of the item. If In-Progress is false, the server MAY assume that it can carry on processing the deposit as it sees fit. If In-Progress is true, the server SHOULD expect the client to provide further updates to the item some undetermined time in the future. Details of how this is implemented is dependent on the server's purpose. For example, a repository system may hold items which are marked In-Progress in a workspace until such time as a client request indicates that the deposit is complete. The client can assert that a deposit process has completed by issuing an HTTP POST to the Object-URL with a blank request body and with the In-Progress header set to false (it may simply omit the header altogether too, as this is treated as In-Progress: false by the server). The client MAY specify a Content-Length: 0 HTTP header, and MUST NOT include any body content. Once the server has processed the request it MUST respond with status code 204 (No Content), or a suitable error. If a client has a very large file that it wishes to transfer to the server by value, then in may be beneficial to do this in several small operations, rather than as a single large operation. Large uploads are at higher risk of failure, depending on a variety of factors, and there is no guarantee that a SWORD server will be able to resume a partial upload. In order to transfer a large file, the client can break it down into a number of equally sized segments of binary data (the final segment may be a different size to the rest). It can then initialise a Segmented File Upload with the server, and then transfer the segments. The server will reconstitute these segments into a single file, and then the client may deposit this file by-reference. Segments can be uploaded in any order, and can be uploaded one at a time or in parallel. If the client is creating a new Object, the Staging-URL can be found in the staging field in the Service Document. If an Object already exists, the client should find the Service-URL from the service field in the Status Document, then GET this URL to obtain the appropriate Service Document, and subsequently get the Staging-URL from the staging field. Request a Temporary-URL[def] from the Service, via a Segmented Upload Initialisation request. Send a POST request to the Staging-URL, as per POST Staging-URL, with the appropriate Content-Disposition (see below). The server will respond with a Temporary-URL in the Location header. Send one or more POST requests to the Temporary-URL as per POST Temporary-URL, with the appropriate Content-Disposition (see below), until all file segments have been uploaded. Carry out the desired deposit operation as a By-Reference deposit, using the Temporary-URL as the by-reference file. Refer to the section [By-Reference Deposit] for more information on this approach. Deposits of content hosted at Temporary-URLs SHOULD NOT contain the ttl or dereference fields in the By-Reference Document, and if they are included, the server MUST ignore them. Before sending any segments to the server, the client must initialise the process. This is done by sending a POST request to the Staging-URL as per POST Staging-URL. The server MAY choose to reject the Segmented Upload Initialisation request at this stage, for a variety of reasons - for example, it may have a limit on the total number of segments it will accept, or the total size may exceed a maximum file size for assembled files. In these cases, the server MUST respond with one of the appropriate Error Types. If the request is successful, the server will respond with a Temporary-URL in the Location header, and the segments themselves can be uploaded to that URL. Segments may be uploaded in any order and may also be parallelised. Segments MUST all be the same size, with the exception of the final segment with MUST be the same size or smaller than the other segments. Segments size MUST be smaller than the maxUploadSize specified in the Service Document. The Content-Type header MUST just be application/octet-stream. The Digest header MUST contain the Digest for the File Segment itself, so the server can confirm successful transfer of the segment. At any point after creating a Temporary-URL, the client may request information on the state of their Segmented File Upload. This can be done via a GET to the Temporary-URL. This will return you a document as described in Segmented File Upload Document. NOTE that you cannot retrieve an actual copy of the full or partially uploaded Segmented File Upload from the Temporary-URL at any point. If a client submits the Temporary-URL as a By-Reference deposit to the server after completing the upload, the client SHOULD NOT delete the Temporary-URL themselves, the server SHOULD take responsibility for this. If the client deletes the resource before the By-Reference deposit has completed, the server SHOULD record an error against the ingest. Servers SHOULD delete incomplete Segmented File Uploads after a specified amount of time (in the Service Document), if they are not finalised with all segments. Servers SHOULD delete completed Segmented File Uploads after a specified amount of time (in the Service Document). Servers MUST be able to tell when they have been given one of their own Temporary-URLs as a By-Reference deposit, and not delete that resource until after it has been ingested. If any other errors occur asynchronously, such as in reassembling or unpacking the resulting file, servers MUST provide an error status field and suitable log information in the link record in the Status document. By-Reference Deposit is when the client provides the server with URLs for Files which it would like the server to retrieve asynchronously to the deposit request itself. This could be useful in a number of contexts, such as when the files are very large, and are stored on specialist staging hardware, or where the files are already readily available elsewhere, and there is no need to push them through a by-value deposit. Clients may use a By-Reference Deposit anywhere a by-value deposit could be carried out. Instead of sending any Binary content, the client sends the By-Reference Document containing one or more (depending on context) URLs to files which the server can retrieve. See the document SWORDv3 Behaviours for an expansion of the Protocol Requirements for requests to deposit By-Reference. The server MUST recognise one of its own Temporary-URLs, and should implement ingest in the most efficient way possible, remembering that you cannot retrieve a copy of the actual Segmented File Upload from the Temporary-URL via GET, so the server MUST have a way to retrieve the content from those uploads in another way. The server MUST NOT delete the resource until after it has been successfully ingested (i.e. the stagingMaxIdle time should be ignored when the server has received the resource as a By-Reference deposit). The following is the procedure that MUST be followed by servers implementing By-Reference deposit. The server creates records for each of these files that it plans to dereference, which then become visible in the Status Document. Files marked by the client not to be dereferenced are considered metadata, and MAY NOT appear in the Status Document. All other supplied Files MUST have the status pending in the Status Document. At its own pace, taking into account the ttl of the Files, the server obtains all the files that are marked for dereference and validates them against their Digest and any other supporting information such as contentType, contentLength, and packaging. During the download the server SHOULD set the status to downloading. The server SHOULD be able to resume an interrupted download. Once the Files are downloaded and processed, the server MUST set the status to ingested. If the Files need unpacking first, the server SHOULD first set the status to unpacking and then ingested when this operation is complete. The server MUST also remove the byReferenceDeposit rel. If there is an error in downloading or otherwise processing the file, the server MUST set the status to error and SHOULD provide a meaningful log message. The server MAY continue to record the original URL of the file if desired. While a By-Reference File is being processed, it MUST be represented in the Status Document under the link field. The following sections show how it is represented. SWORD allows the client to deposit arbitrary metadata onto the server through agnostic support for metadata formats. A metadata format is any document which expresses metadata in a given serialisation. SWORD has a default format which MUST be supported by the server, which consists of the set of DCMI Terms [DCMI] expressed as JSON (see Metadata Document). Any format (combining the 3 aspects above) may be represented by an IRI in the protocol, or an opaque string if no IRI exists or can be minted. The server can list Metadata formats that it will accept in the acceptMetadata field of the Service Document. If no acceptMetadata field is present, the client MUST assume the server only supports the default SWORD metadata format (http://purl.org/net/sword/3.0/types/Metadata). If this header is not present the server MUST assume it has the above value. It does not pre-suppose any particular profile of usage of these vocabulary elements. Clients MAY choose to extend this document with their own metadata fields, though the server MAY NOT understand them, and MAY ignore them. In addition to the standard SWORD metadata format described above, SWORD can support the deposit of arbitrary metadata schemas and serialisations. Clients who wish to ensure that their servers support all the metadata they send them should consider minting a new identifier for their format, and looking for servers to declare explicit support for it. If the server supports the MODS Metadata-Format, identified with the IRI http://www.loc.gov/mods/v3 then it will be able to create a new Object from this XML document, and populate the Metadata from the data therein. SWORD allows you to deposit both Files and Metadata simultaneously through support of Packaged Content. SWORD does not place any limitations on the number or type of packaging formats that the client/server support, though see the section Packaging Formats for the packages that MUST be supported by the server. The Service Document uses the acceptPackaging field to indicate that a Service will accept deposits of a particular packaging format, and the acceptArchiveFormat field to indicate the serialisation/compression formats that it understands. Clients should refer to the treatment description in the Service Document to find out the treatment for a particular packaging type. Packages formats SHOULD be identified by a IRI, but MAY be identified by an arbitrary string. If no acceptPackaging field is supplied the client MUST assume that the server does not formally support any package formats, and should expect everything to be treated as per the server's policies with regard to the mimetype as per the accept element. If no acceptArchiveFormat field is supplied the client MUST assume that the server supports application/zip only. When depositing Packaged Content, the client SHOULD indicate the archive file MIME type using the Content-Type header, and SHOULD also give information about content packaging using the Packaging header. The value of the Packaging header SHOULD match one of values the server has advertised as acceptable for the service. If a server receives a POST with an unacceptable Packaging header value, it MUST reject the POST by returning an HTTP response with a status code of 415 (Unsupported Media Type) and a SWORD Error document with URI http://purl.net/org/sword/3.0/error/PackagingFormatNotAcceptable, or store the content without further processing. Status documents can speak about packaging in two distinct ways, depending on whether an element in the links list refers to a file that was deposited, or a file that is available for retrieval by the client (or both). When a package has been deposited as the Original Deposit, it SHOULD record the packaging format and content type alongside it in the record. There are 3 packaging formats the all SWORD implementations MUST support. This format indicates that the package should be interpreted as an opaque blob, and the server SHOULD NOT attempt to extract any content from it. This is typically for use when depositing single files, which do not need unpacking of any kind. Servers MAY choose, nonetheless, to extract content from Binary packages, if they have the capabilities, such as metadata from images, structural information from text documents, etc. This format indicates that the package is a compressed set of one or more files in an arbitrary directory structure. The nature of the compression and the structure of the compressed content is not specified. 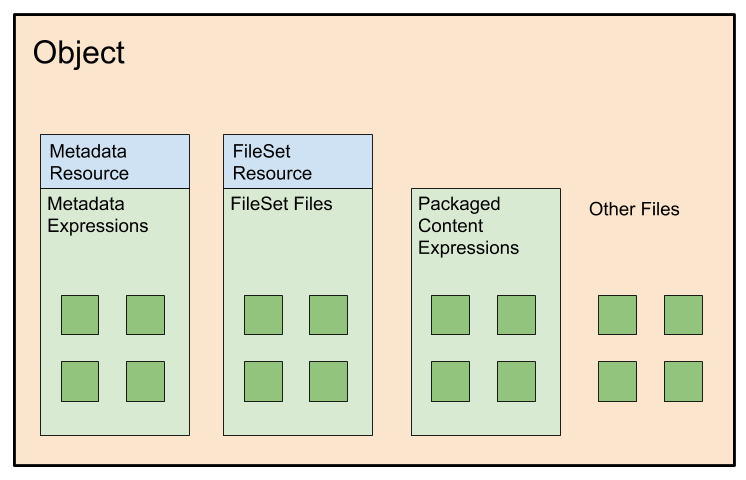 Servers MAY choose to extract the content from SimpleZip packages, and present the individual file components as derivedResources, if desired. This format is a profile of the BagIt directory structure, which has in turn been serialised (which may include compression). The nature of the serialisation/compression is not specified, though if the client wishes the server to extract the content, it SHOULD use one of the formats specified in the Service Document field acceptArchiveFormat. This allows us to represent the item as a combination of an arbitrary structure of bitstreams in the data directory (similar to SimpleZip), and the metadata in the sword default format in metadata/sword.json. A manifest (and tagmanifest) of sha-256 checksums is required, as well as the bagit.txt file and a bag-info.txt file. The content of sword.json is exactly as defined in the SWORD default Metadata. Note that use of fetch.txt is not supported here. The server SHOULD unpack this file, and action at least the Metadata. The contents of the data directory MAY be unpackaged into derivedResources if the server desires. It is RECOMMENDED that the contents of the data directory be a flat file structure, to aid mutual comprehension by servers/clients. In order to assist potential clients discover a server’s capabilities, SWORD RECOMMENDS the following auto-discovery features to be embedded in any web interfaces associated with the service provider. Embed an html link with a rel value of http://purl.org/net/sword/3.0/discovery/Object in any page which represents a deposited resource.